The Year 12 Retreat is particularly special because it is one of the last times students will relax and renew together as a year group. Year 12 Students face the prospect of life beyond school, beyond teachers and beyond the Catholic school support network that has nurtured them for up to 13 years. 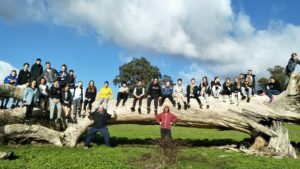 The Yr 12 Retreat is very expressive and gives students the opportunity to openly share their feelings, hopes, memories and uncertainties. Reflection days are conducted at Year 8, 9 and 10. These days are part of the school’s Religious Education program. The days are generally held off campus away from the distractions of the normal school environment to help students to better focus on themselves, their spirituality, their relationships with each other, the wider community and God.